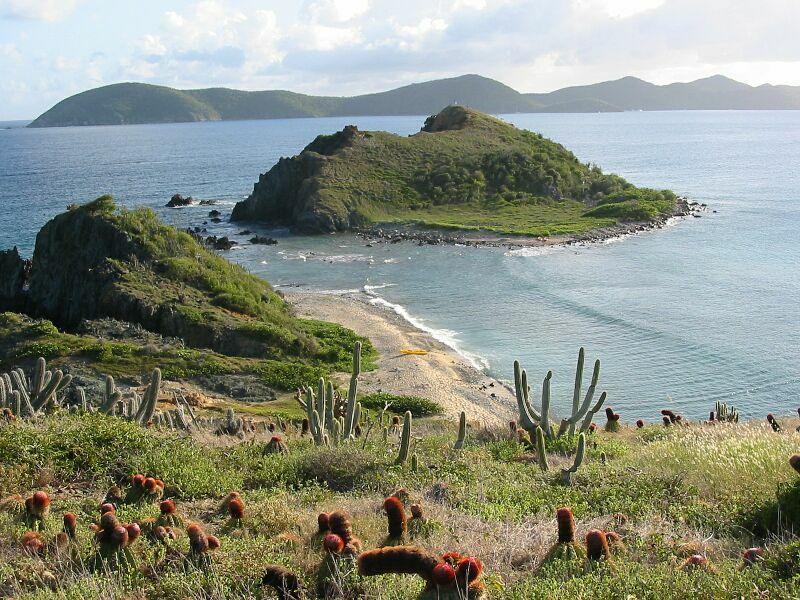 Virgin Islands. Each colored line represents a day's passage. This map should help you understand our route described below. 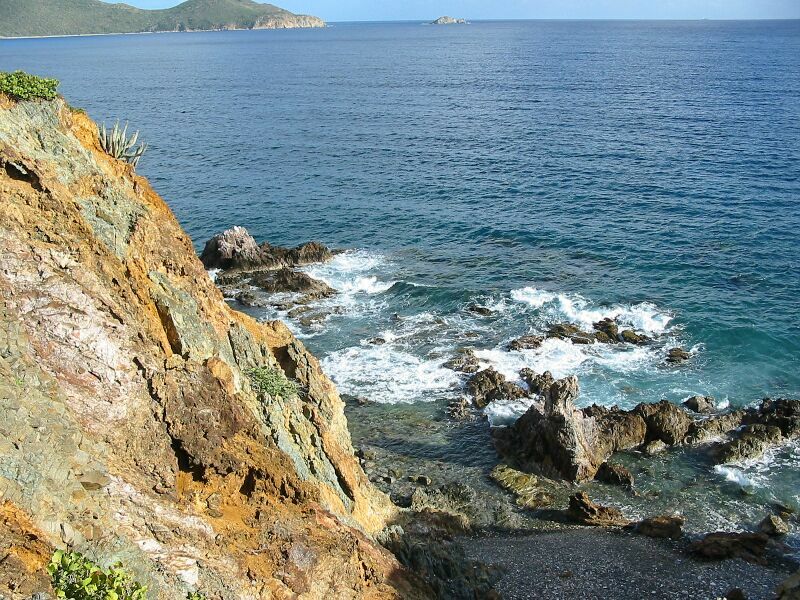 This section documents our stay in the British and U.S. Virgin Islands. We plan to return to the VIs before heading across the Atlantic to the Mediterranean in April or May next year. We took a "rest" after our passage from Bermuda for a few days. We spent several days just visiting from island to island, snorkeling, kayaking, hiking, and hanging out. We kept up with homeschooling of course, but we did not force ourselves to do too many maintenance chores on the boat. On November 24th we cleaned up the boat a fair amount as we had invited Stu and Elizabeth Anne from Shearwater over for some dinner. It was a nice dinner, but we mostly just talked about our boats. One drawback to putting owners of the same model together for too long. :-) This "activity" did put the girls asleep early though. During the first few days out Frank especially enjoyed trying out the new underwater housing for our digital camera. 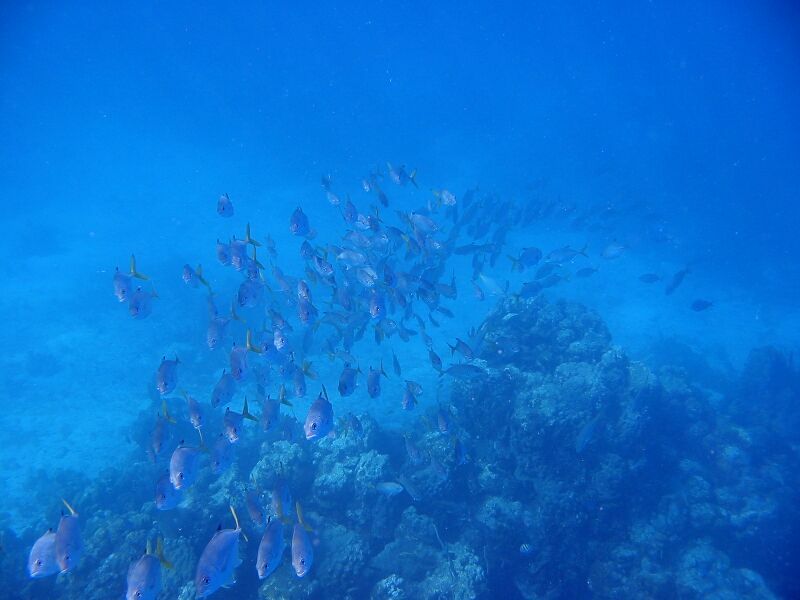 See the section on underwater photography. We spent a couple of days in Leinster Bay, St. John. 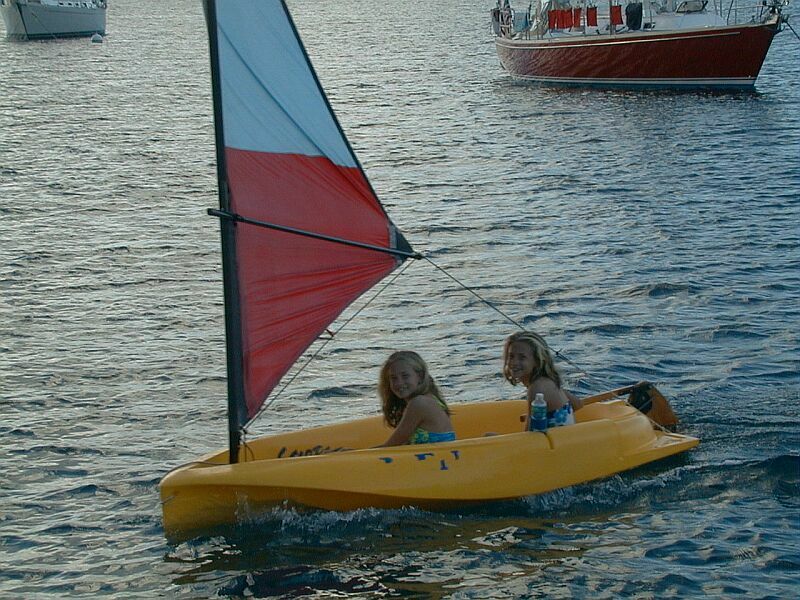 We snorkeled, swam, kayaked, and the girls got to sail in Shearwater's little yellow sailboat. They did an amazing job as this was their first time to sail by themselves. They sailed all over the bay without capsizing or hitting anything! Shearwater also had an inflatable jet ski which the girls got to ride as well. 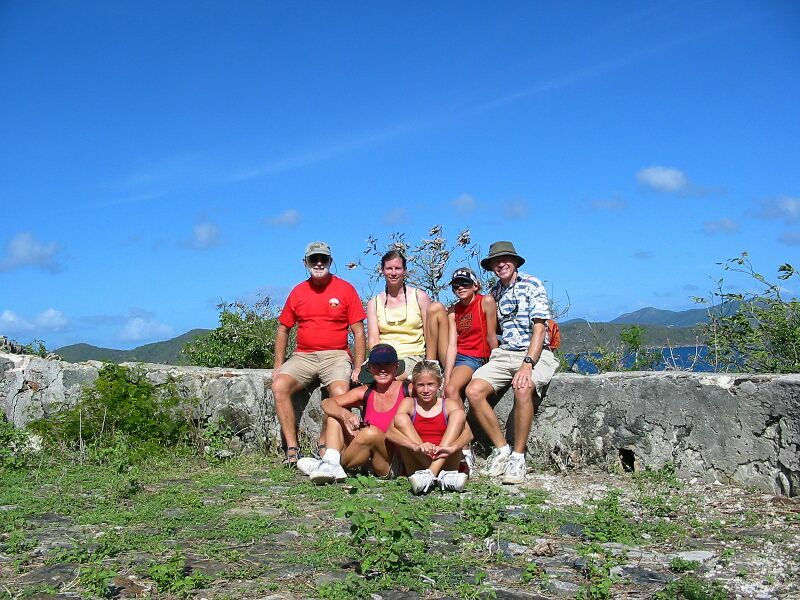 One day we (crews from PatiCat and Shearwater) hiked over to Coral Bay. This involved a climb to about 1000 feet in altitude above sea level. Fortunately only a couple of sections were really steep. 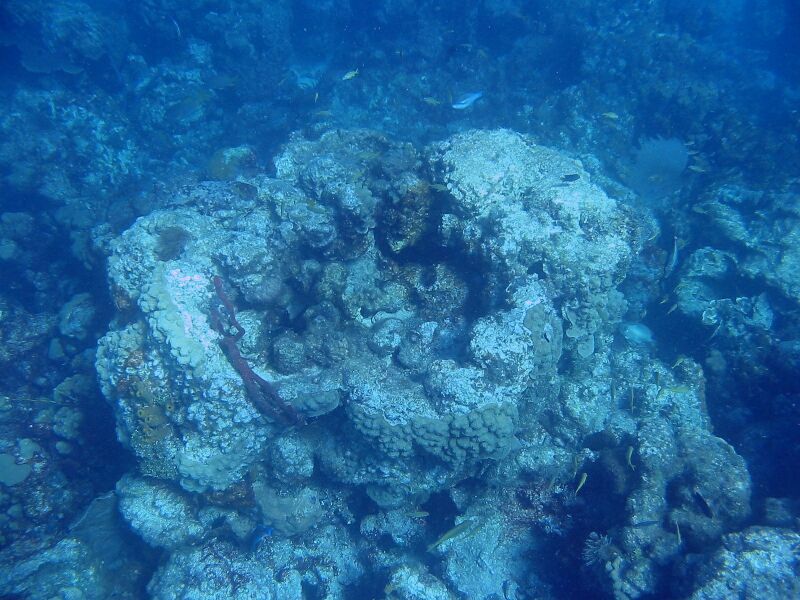 The main steep part was coming down into Coral Bay. We quickly decided a cab or bus ride back to our bay would be prudent. Anyway, we went to Skinny Legs Restaurant for lunch. 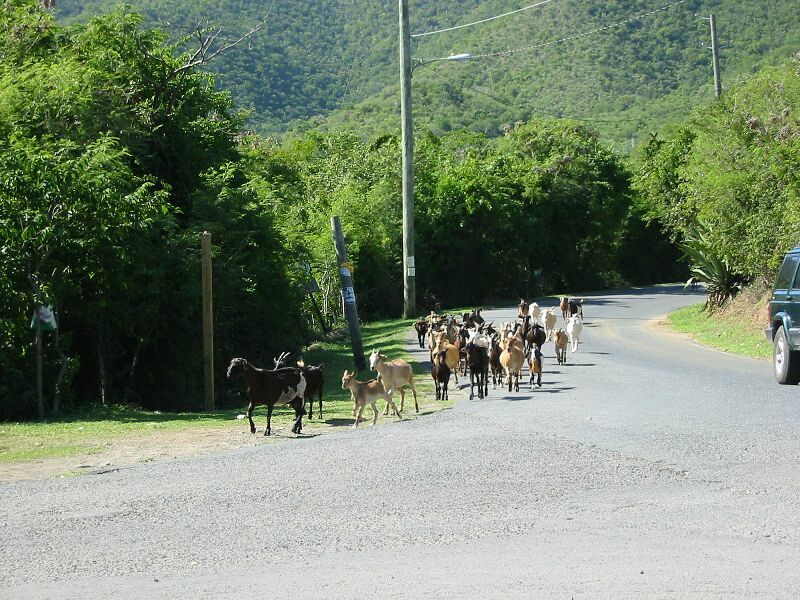 Afterwards, we finally caught a cab while sitting on the Skinny Legs bench, and after watching some goats cross the road. Here are some pictures from the hike. After our relaxation period we took PatiCat back over to Soper's Hole on the 25th of November and spent a day getting our laundry done - only this time we got a service so we didn't have to fold or wait around! So, the girls shopped while Frank uploaded the major reorg of the web site he'd been working on, and then worked on the boat. We also realized we had managed to break our tiller arm on our outboard motor for the dinghy. Apparently it got caught in the lifting bridle. Glue did not work as a repair, and welding aluminum is not advised - so a new one was ordered. 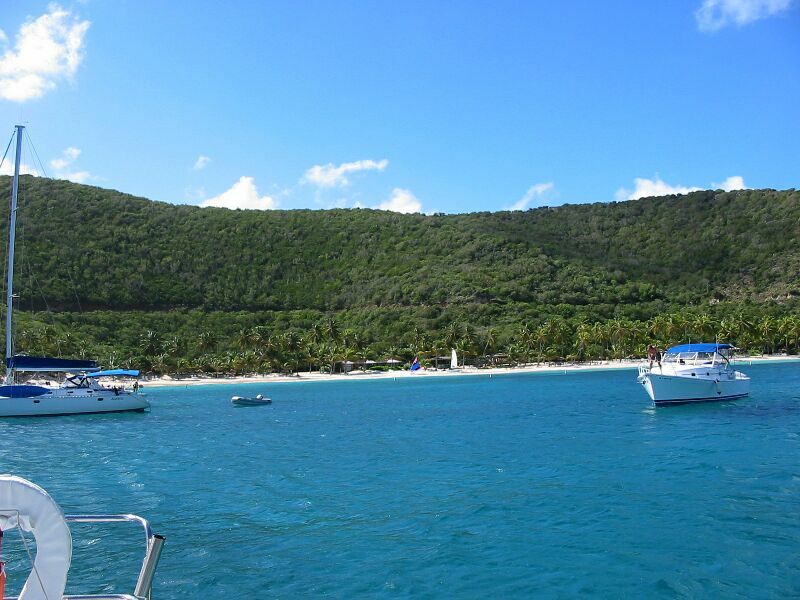 We decided to sail over to Jost Van Dyke for a night and to make reservations at Foxy's (a famous bar and restaurant) for Thanksgiving Dinner. Ended up having dinner at Foxy's and the food was good. We sailed back to Soper's Hole the next morning to pick up our finished laundry. 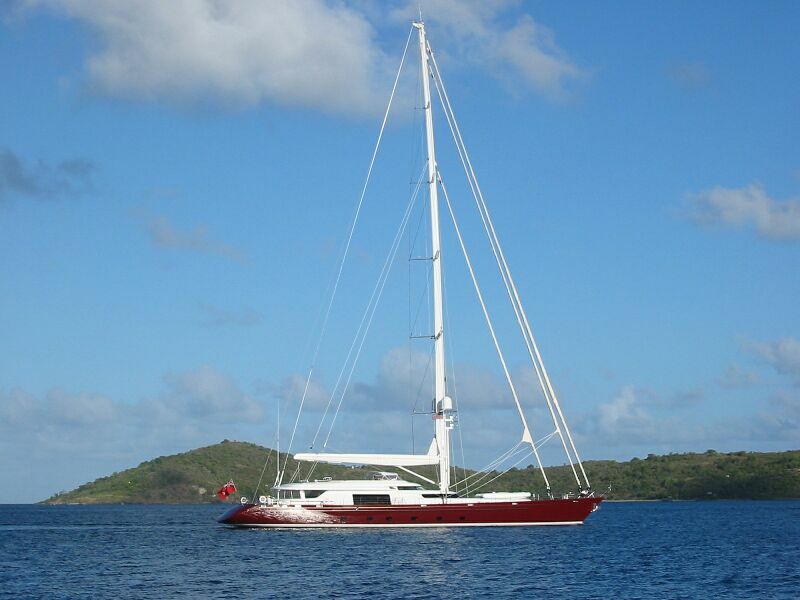 We sailed along with Shearwater over to Road Harbour, Tortola for some big-town shopping/gear equipment buying. Frank managed to get the slugs needed to repair the trampoline, some filters, and some spare lightbulbs. Karen and the girls got some more provisions. Around 3:00 we sailed over to Dead Man's Bay on Peter's Island and anchored. A big day of sailing, with very little motoring required. We stayed at Dead Man's Bay for two nights. 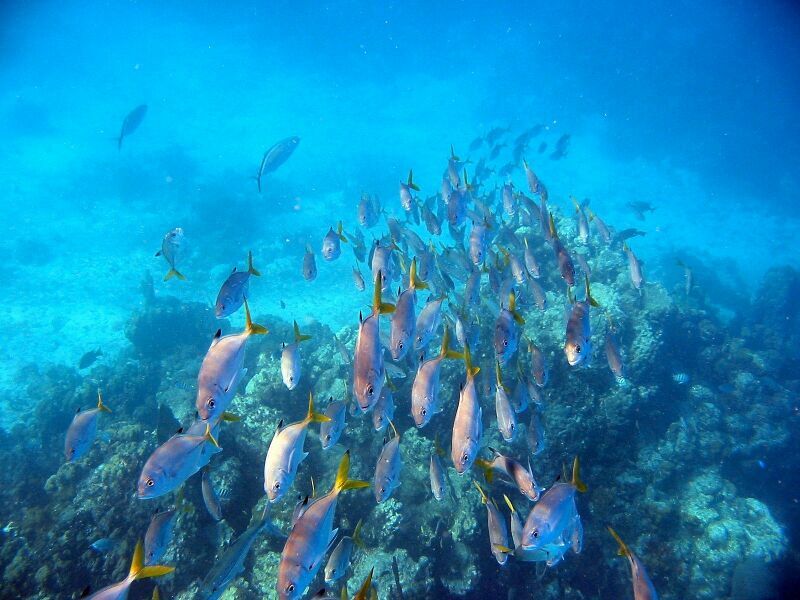 It has a beautiful beach and good snorkeling, swimming and kayaking. The first morning Frank spotted an Eagle Ray in 3 feet of water while kayaking. During lunch Frank found out why they're called Eagle Rays as one leaped 7 or 8 feet in the air not 50 feet away from PatiCat! It was a most memorable sight and Frank only wished he had a camera - ideally a video camera. Absolutely amazing! 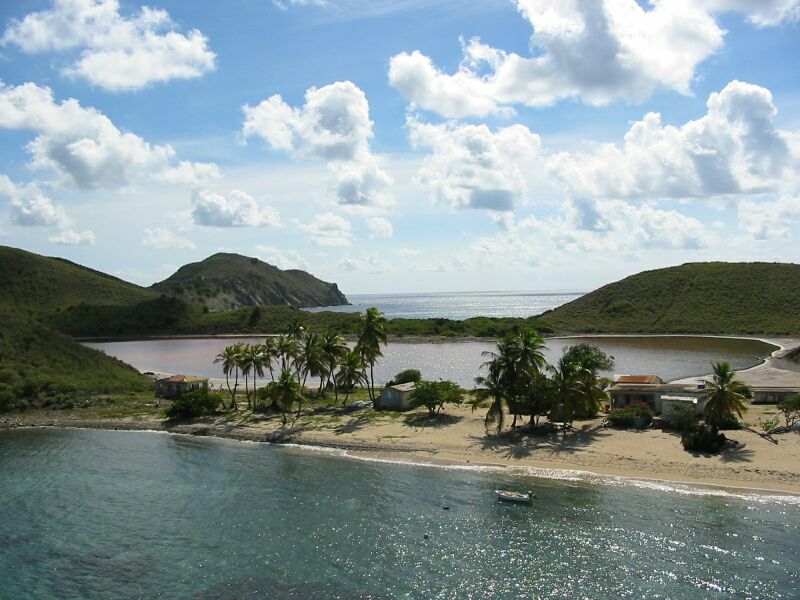 Here are some pictures of Dead Man's Bay. The first shot shows Dead Chest Island (these islands are the ones from the famous song "Yo Ho Ho and a bottle of rum...21 men on Dead Chest"). 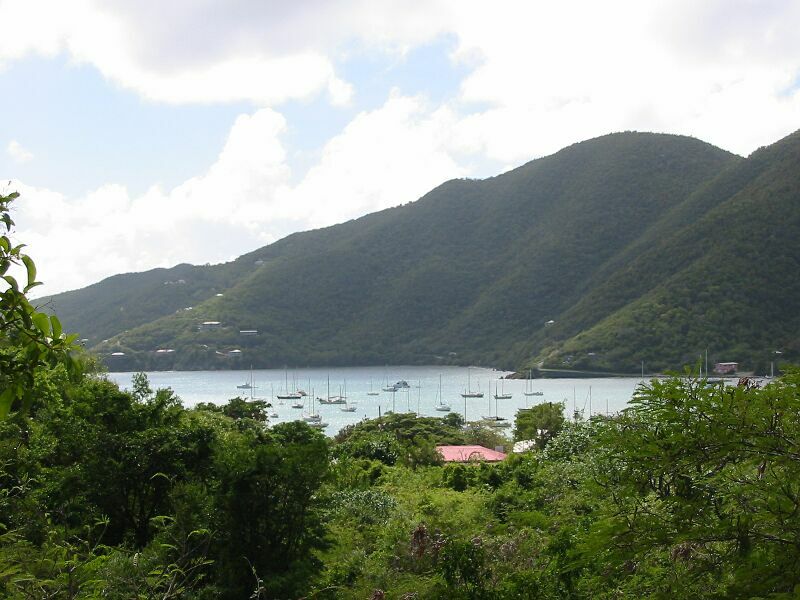 On the second morning at Dead Man's Bay, Thanksgiving Day, we moved PatiCat over to Great Harbour, Peter's Island. 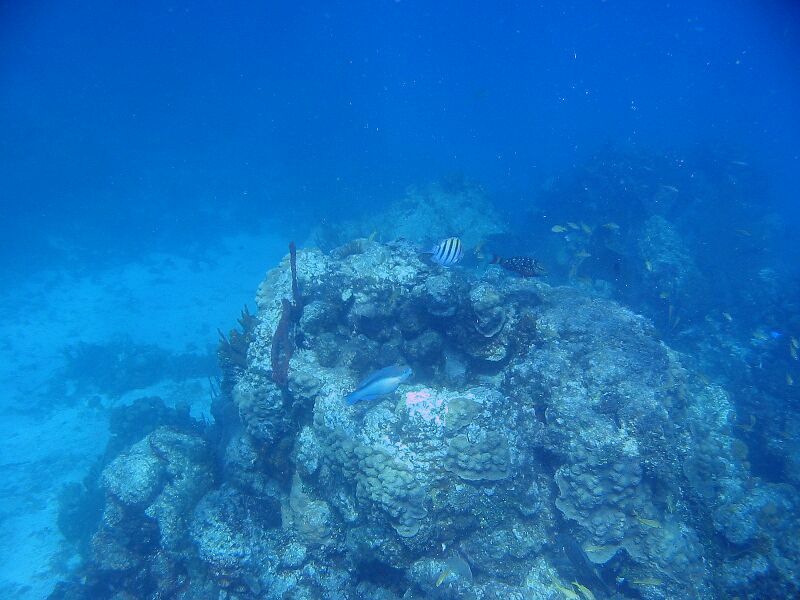 Frank took some more snorkel shots at a nice reef located near the beach bar there. Before leaving Great Harbour, Karen gave Frank a nice - and needed - haircut. 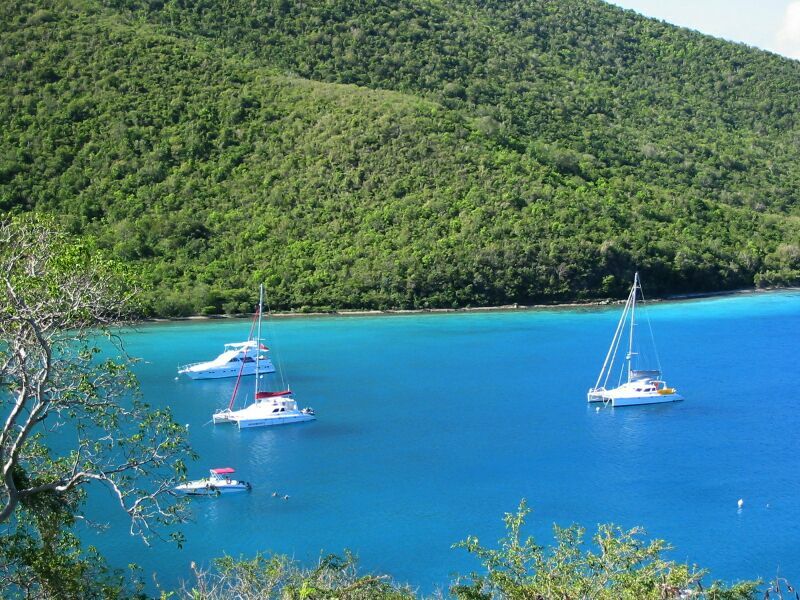 We then sailed all the way over to Great Harbour, Jost Van Dyke. We managed even to sail around Little Thatch and through the gap past Soper's Hole. A nice bit of sailing for us. 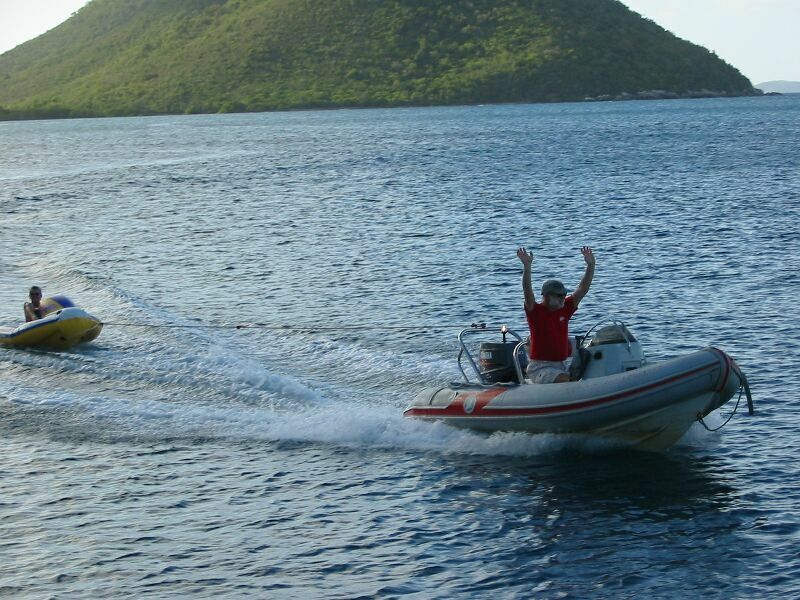 We had to motor into the Harbour as there was quite a crowd of boats anchored. But, we found a spot to anchor - only it took us three tries to set the anchor (I felt better when I found out later that Bruce from Genesis had gone as many as 6 tries to set there). Thank goodness we had made reservations at Foxy's. We had time to take showers and get dressed up. Here's some pictures at Foxy's, including a shot of Foxy himself (he was - as Vanessa put it - well oiled). 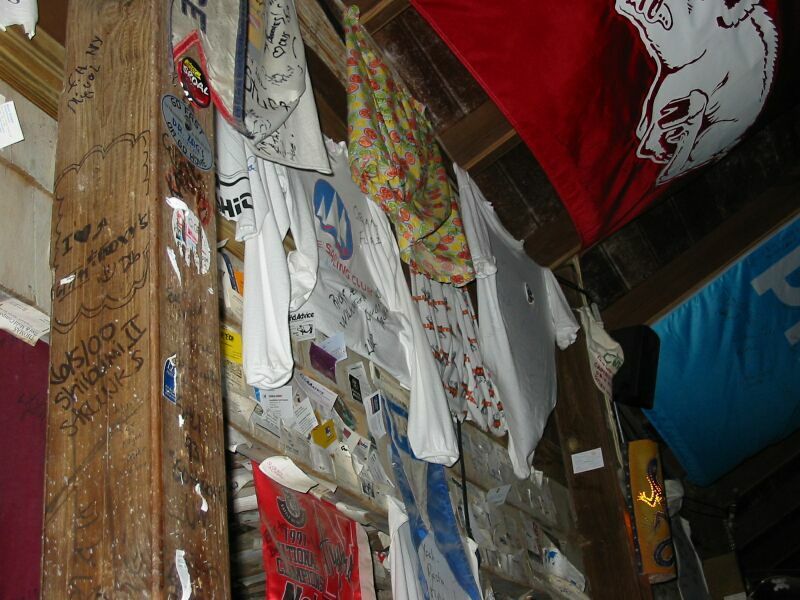 Notice all the paraphernalia plastered everywhere. 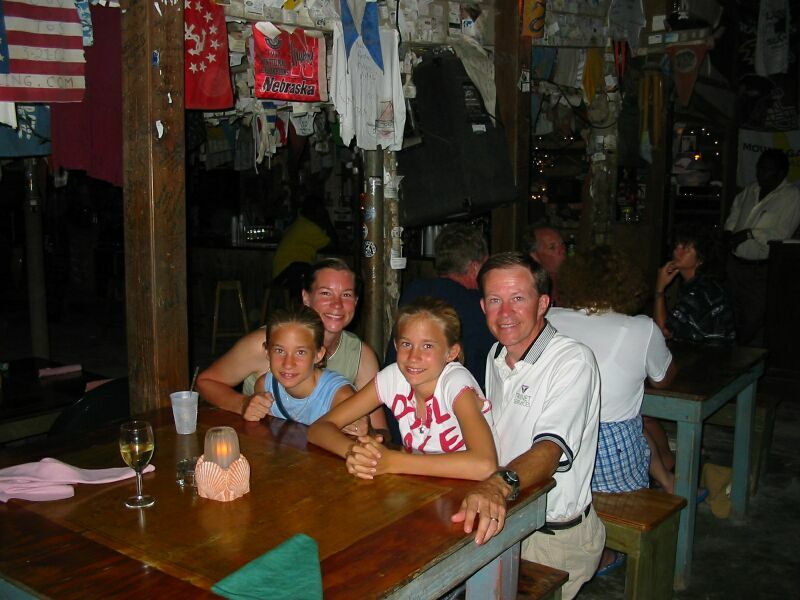 We also got a nice shot of the family taken by our waitress. The next day there was little to no wind (less than 7 knots) all day. 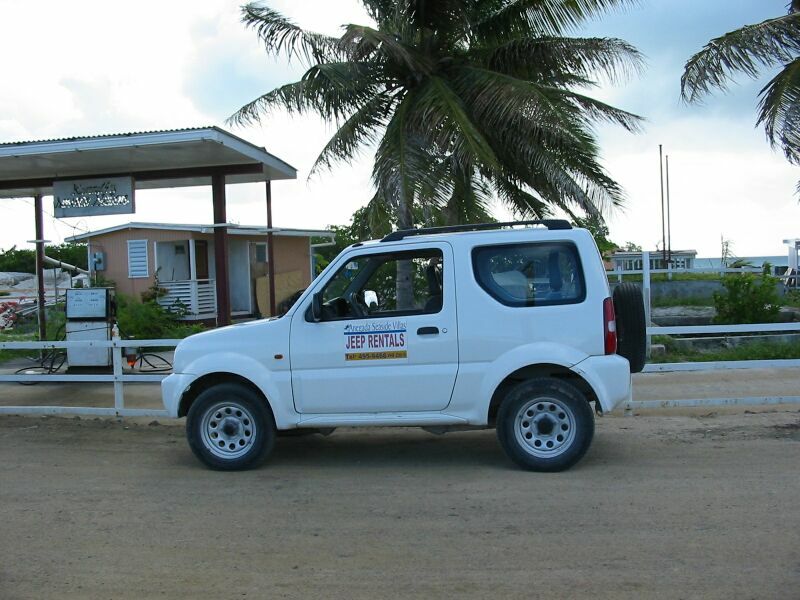 So, we motored all the way to Road Harbour. We got fuel, more provisions, and some more boat equipment. But, we found out the tiller arm for the dinghy was not going to arrive until next week. They forgot that their store in St. Thomas was closed for the holidays. Ugh. 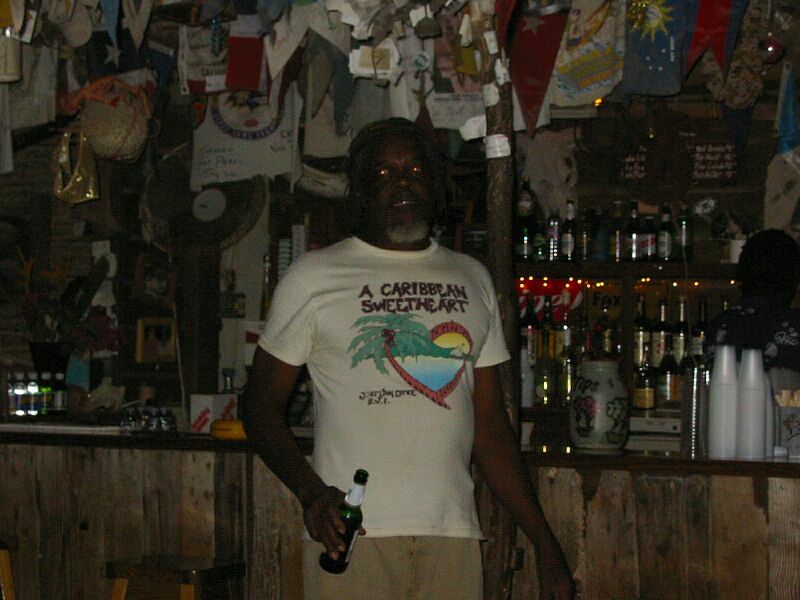 We motored the boat over to Salt Island, and guess who was there! Yep, our friends on the charter boat Genesis - Bruce and Vanessa. They had guests of course, but were glad to see us as their guests had kids. Salt Island is better known as the site of the wreck called the Rhone (a 310 foot UK mail ship which wrecked during a hurricane in the 1800s). 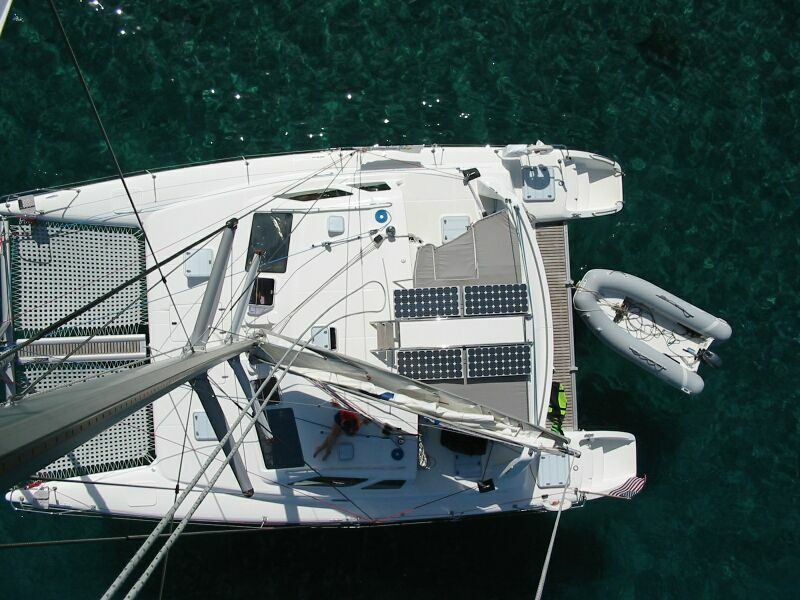 But, Salt Island also has a salt flat in the middle which you can see below from the top-of-the-mast shot Frank took. Also included are some shots of Genesis and PatiCat from above, and a couple of shots of the Rhone wreck from snorkeling perspective. 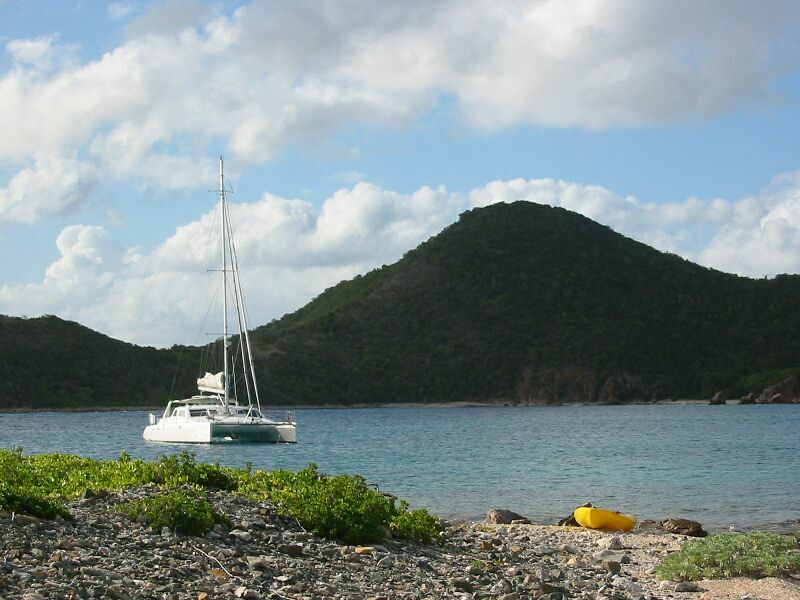 The next day we sailed over to The Baths, Virgin Gorda with Genesis ahead of us (no we couldn't outsail a 50 footer). Unfortunately, we didn't take any pictures, so we'll have to go back to take some in order to share the sights. It's quite a cool place with huge carved bolders with lots of caves and places to climb. Genesis left a couple of hours later, so the girls said goodbye to their new friends (who were from Michigan by the way). 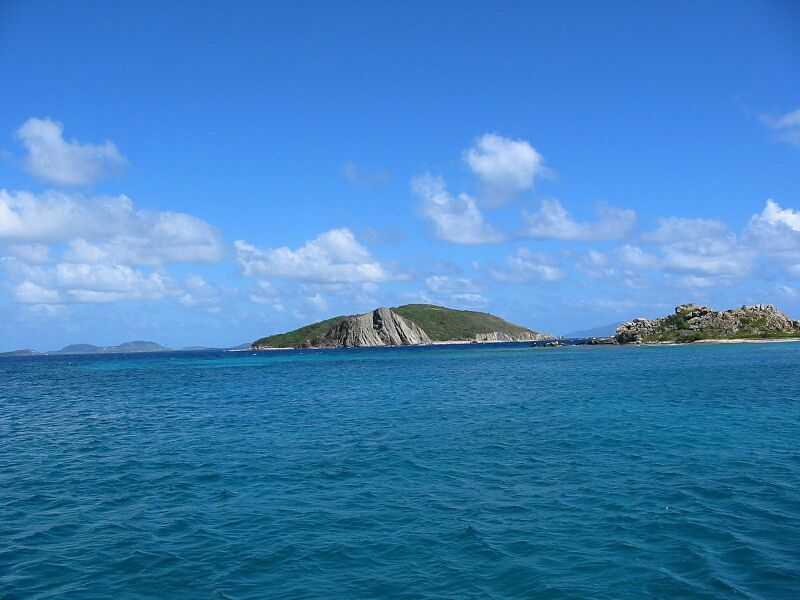 On December 1 we had a nice sail of a little over 10 miles from Virgin Gorda around Peter Island. We had intended to go back to Bensure Bay on Norman Island, but as we were passing Peter Island we saw this beautiful looking anchorage hiding behind a point. It was called Key Cay (pronounced Key-key) and the point is Key Point. 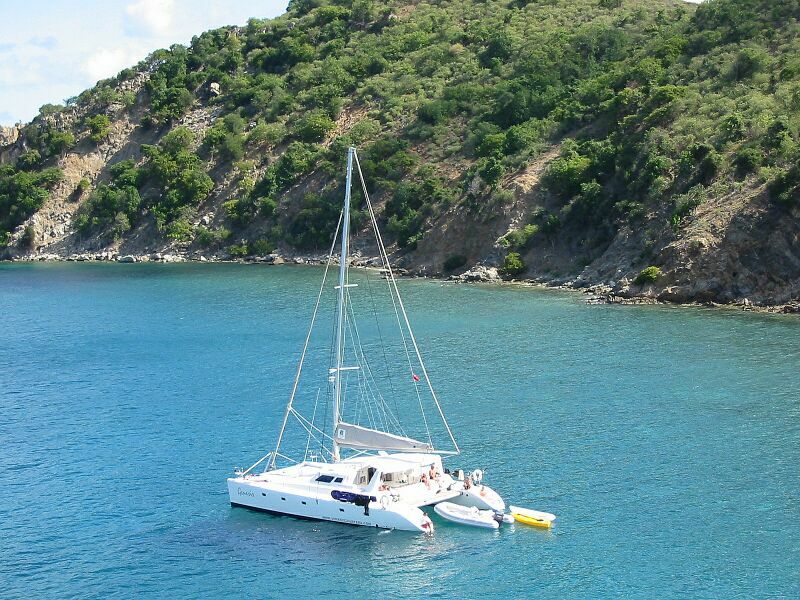 We decided to pull in, and parked next to another smaller catamaran already there. On December 2nd we sailed downwind to Soper's Hole (about 9 nm) and that's when we did the Dec. 2nd web site update. Continued to try and get the tiller arm - was told to call again the next day. So, we went over to Leinster Bay again and met up with Shearwater again. 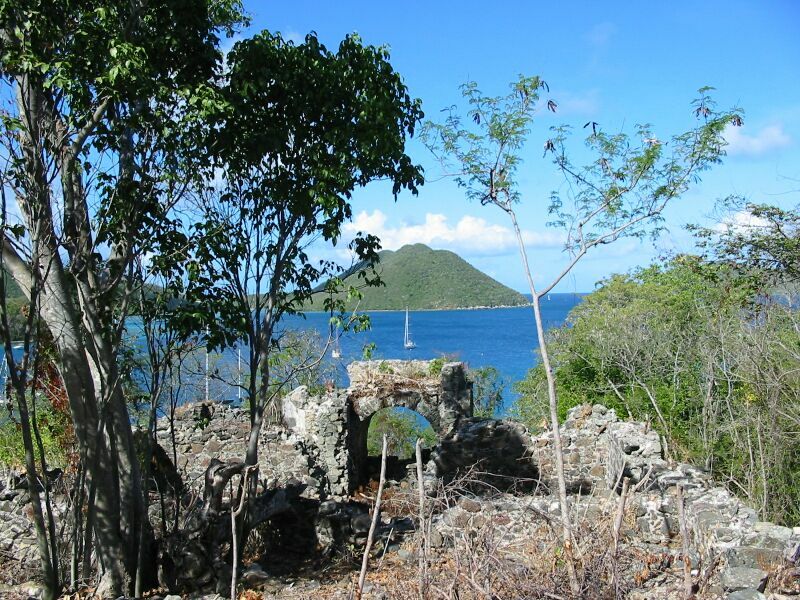 We signed up for the Reef Bay Hike at St. John's for later in the week with them. The next day we sent some E-mails to Frank's Mom as it was her birthday, and the girls made her some web page "birthday cards". The tiller arm for the dinghy motor finally arrived. 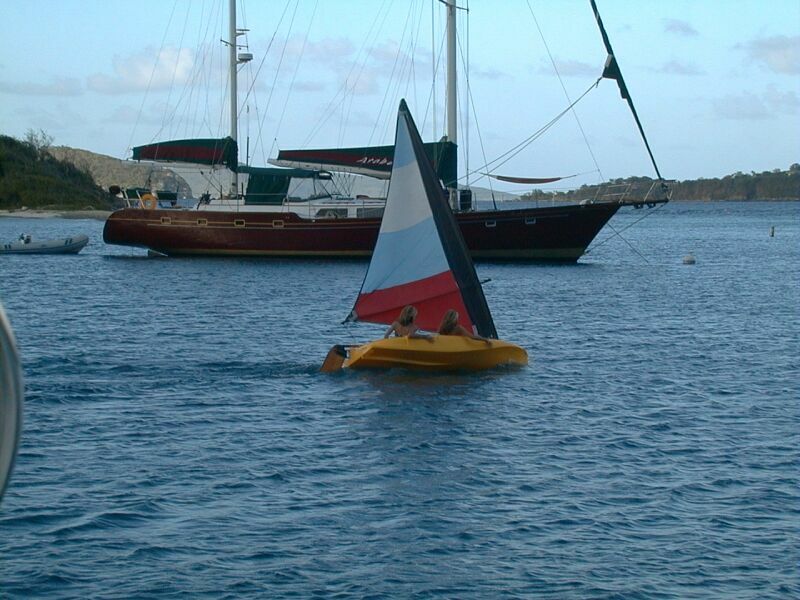 Stu from Shearwater offered to use his bigger dinghy to take Frank over to Road Town in Tortola (about 7 miles away) as he had to check on a sailmaker. This was an interesting adventure, first because there was some choppy waves in 15-20 knots of wind mostly in our face. But, secondly because we (Stu and Frank) rescued someone! We saw a ferry boat (about a 25 person boat) go by us at one point. A few minutes later we noticed a small fishing boat (about 20 feet) with no one on it, and the ferry turning around about a quarter of a mile ahead. We noticed debris in the water, and then a guy swimming to the fishing boat which noticably had a chunk taken out of it. We rushed over as the guy was trying to get in his boat and tried to help him. Turns out the ferry boat ran right over the aft quarter of the fishing boat. The fisherman had tried to stand up and wave them down, but they completely missed seeing him. He jumped overboard just before they hit his boat. As we were in a more manuverable boat, we ended up picking up the captain of the ferry to come over and talk to the fisherman who was quite shaken. Of course, the fisherman had a few choice words to say to the captain of the ferry! The captain just told him to call his company and everything would be taken care of. We then helped the fisherman pull his anchor up and towed his boat back to his harbour about 1 mile away. He was very grateful. The captain of the ferry was too shook up himself to say anything to us when we took him back to his boat before we towed the broken boat. Whew - what an interesting experience! We went on to get the tiller arm and Stu ran his errand. Then we headed back to our boats and arrived about an hour later. 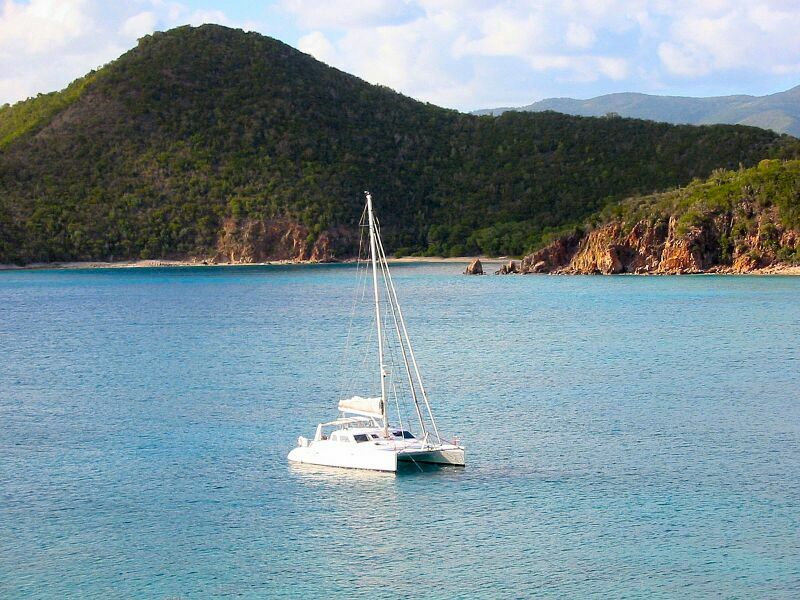 On December 4th We cleared out of the BVIs and headed over to the US Virgin Islands and cleared in at St. John. Again we had a nice sail with the only notable event being that Frank gashed his forehead slightly while in the engine room. No big deal - it just needed some stirry strips and a bandaid. 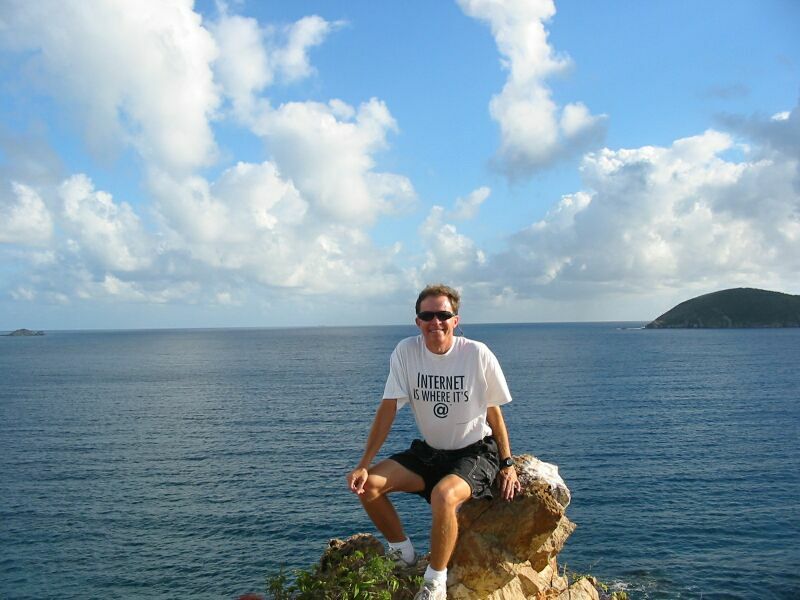 We then went over to Red Hook Bay in St. Thomas and went ashore and did some shopping. The next couple of days were spent either shopping, doing home schooling, or working on the boat. We found a nice used book shop and got some books. The girls played with some kittens and puppies the store owner was caring for. 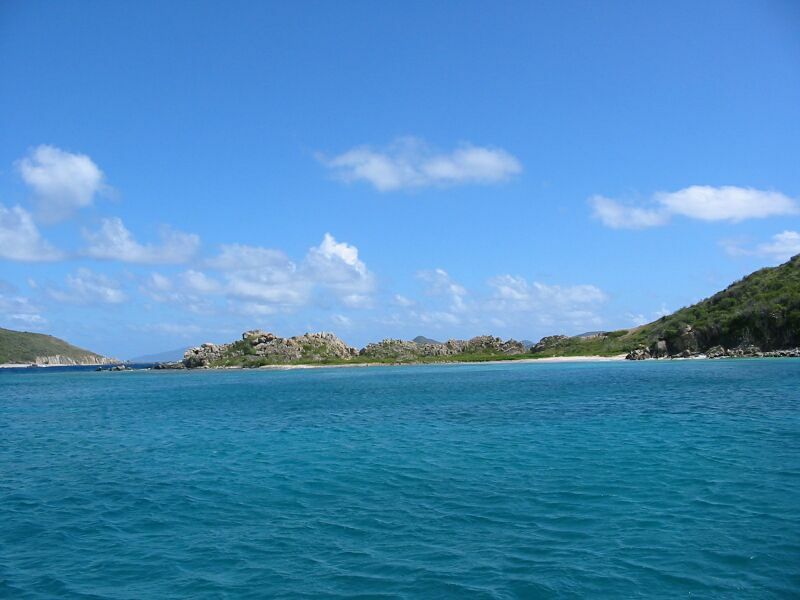 On December 6th we got up and dinghied from Caneel Bay (where we moved the day before) to Cruz Bay, St. John. We needed to catch a taxi with Stu and EA of Shearwater to the trail head of the Reef Bay Hike. This hike is done under the tutelage of a US Forest Ranger. Our ranger was quite good and we learned all sorts of things along the trail. The girls stayed close to the ranger and asked all sorts of questions during the walk. The ranger remarked that the kids were quite bright and inquisitive. Frank's favorite lesson was how to tickle a tarantula out of its hole. The only problem is they are hard to get out during daylight as they are nocturnal. Never got a picture of one, but we did see them a couple of times. 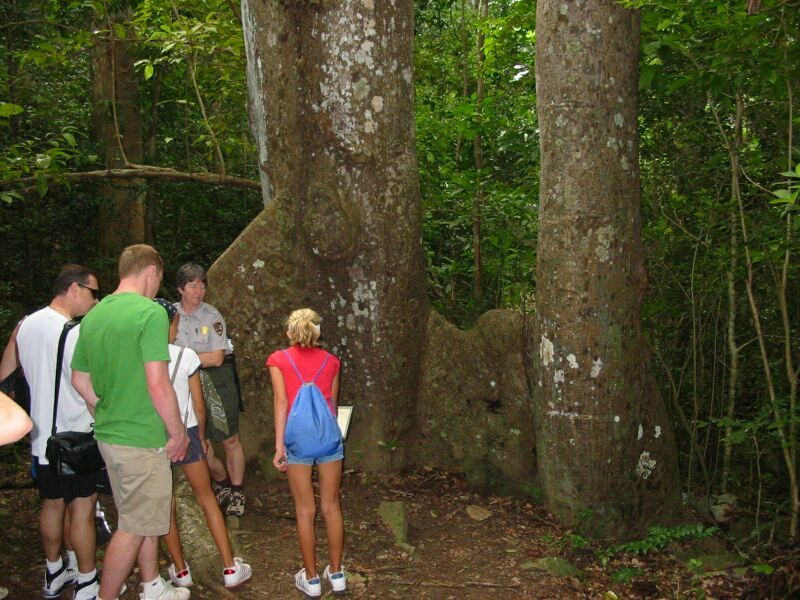 The hike included lessons about trees and other vegetation, various insects, mango fruits, leaves you can write on, and history of the area including pointing out early settler ruins mostly of sugar plantation owners. The highlight was supposed to be some petroglyphs left by Taino indians (who occupied the island at the time Columbus first came by). 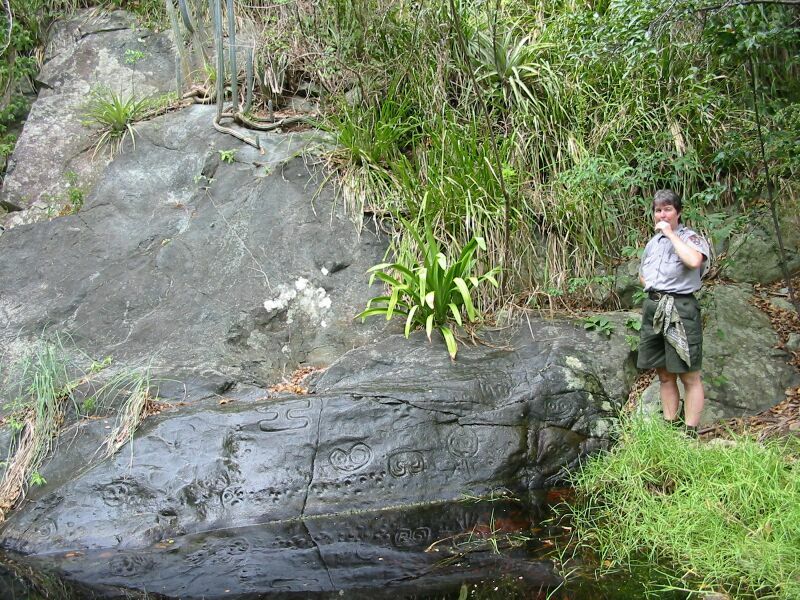 Although the petroglyphs looked interesting, the Forest Service didn't have much information on them. We just ate lunch there and watched the mongooses (or is that mongeese? :-)). 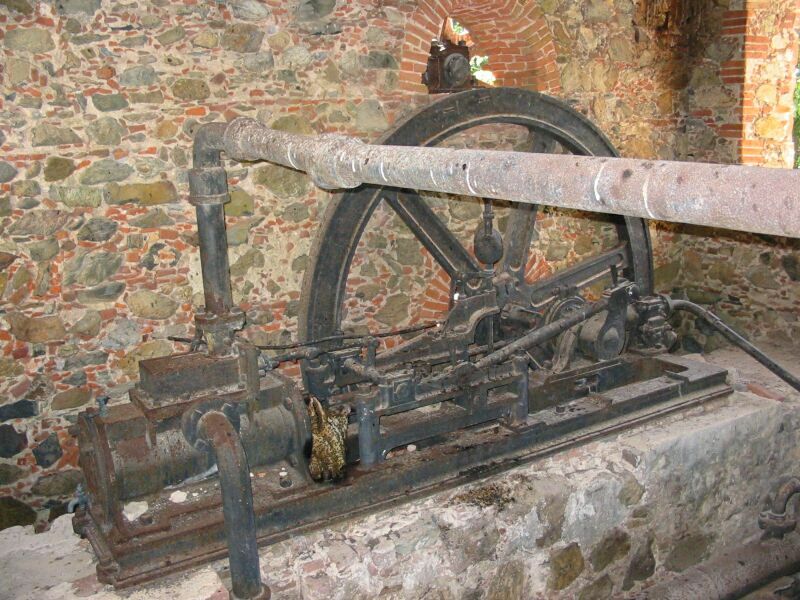 Finally we went to an old sugar mill which had upgraded to a steam driven press after the emancipation of slavery (but, the plantation still failed after the discovery of sugar beets). 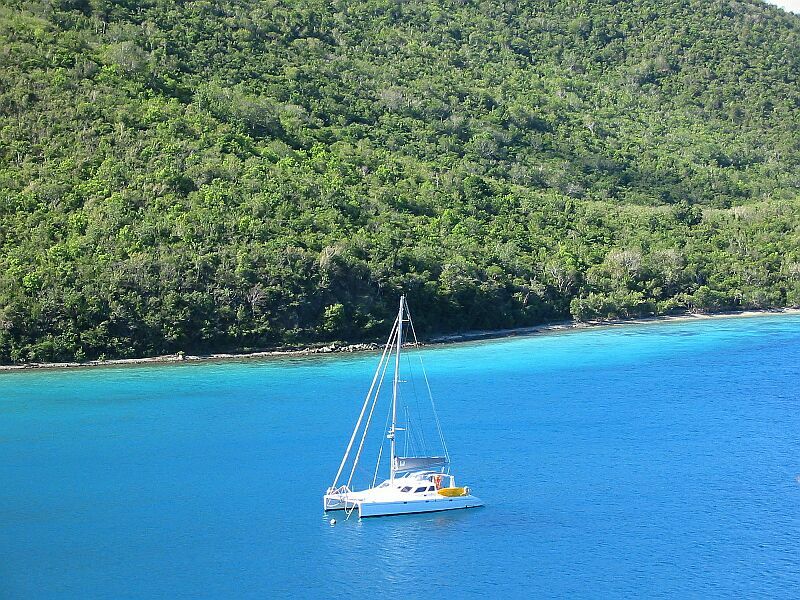 On December 9th we finally left the U.S. Virgin Islands and reentered the BVIs. Before leaving we dropped by to say goodbyes to Stu and EA and they had Christmas gifts for the girls. We'll miss their company! At the same time we cleared in to the BVIS we cleared out of the BVIs for the 13th of December as we planned to leave then from Anegada - which has no customs office. 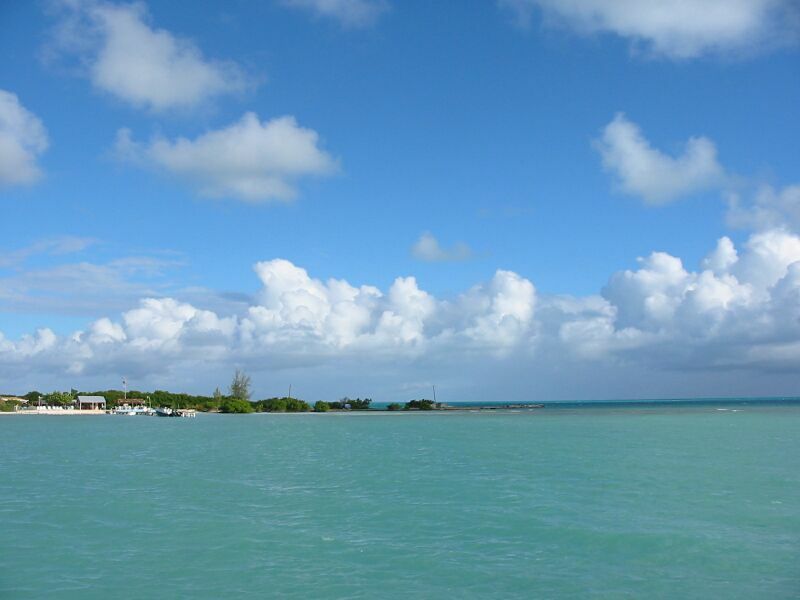 We anchored off Green Cay for the night and then left for Anegada on December 10th. We had a nice upwind sail with only a few tacks needed to get our way to Anegada - about 36 miles traveled. 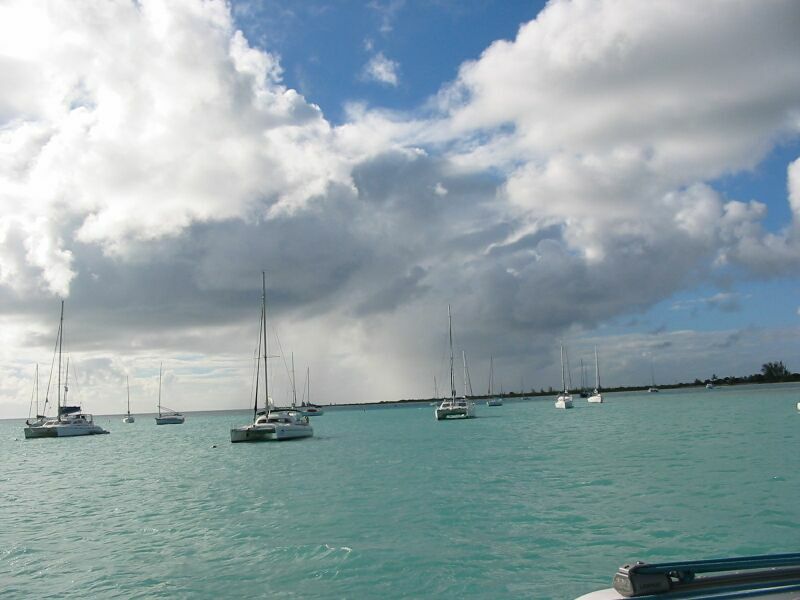 Anegada is a very flat island (the highest point is 28 feet) as it is a coral-based island (the other islands in the VIs are mostly volcanic). It also is not very developed from a tourist perspective. Which is nice. We spent the week there exploring the island. The second day there we rented a jeep and drove all over the island. We had a fun time trying to find certain roads and ended up being glad we had the 4 wheel drive. Some of the roads were quite rocky, some sandy, and there were a few bogs which we did not approach. We saw the flamingos on the far side of Flamingo Pond, but were not able to get close enough for pictures. The girls enjoyed digging holes in the sand at nearly every beach we visited. 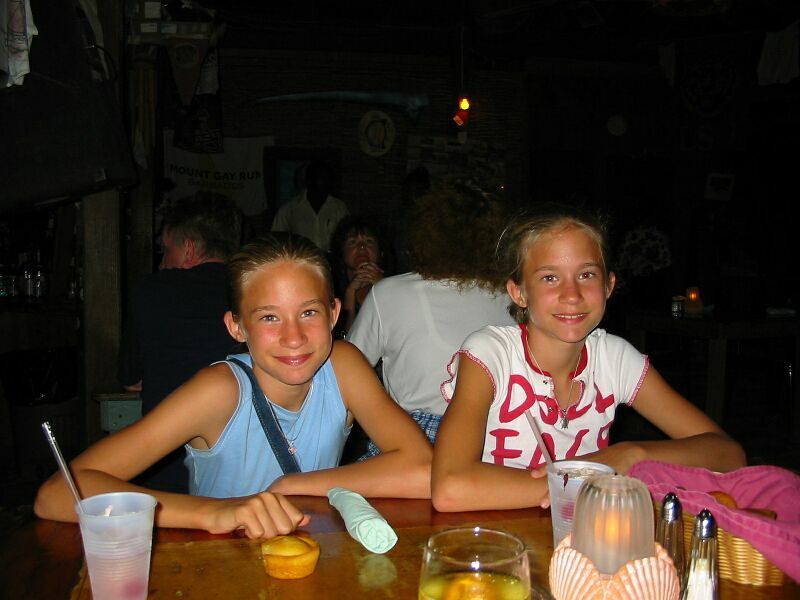 We had a nice lobster dinner at a restaurant owned by the same guy who rented us the jeep. We saw him preparing the fresh lobster (still kicking) before we went over to his restaurant. Had a nice time on their beach watching the sun set and stars and the moon come out while waiting for dinner. 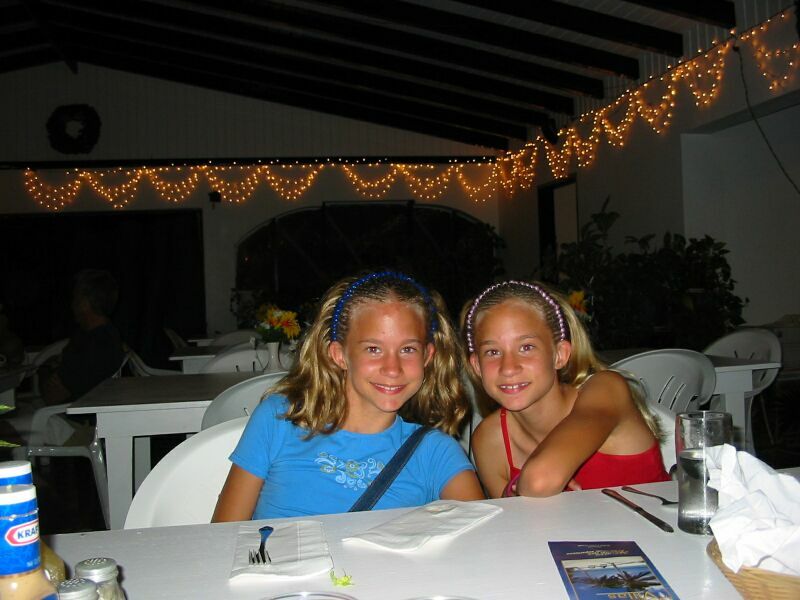 One disappointment was that Anegada no longer allows diving around the island due to damage to the reefs. 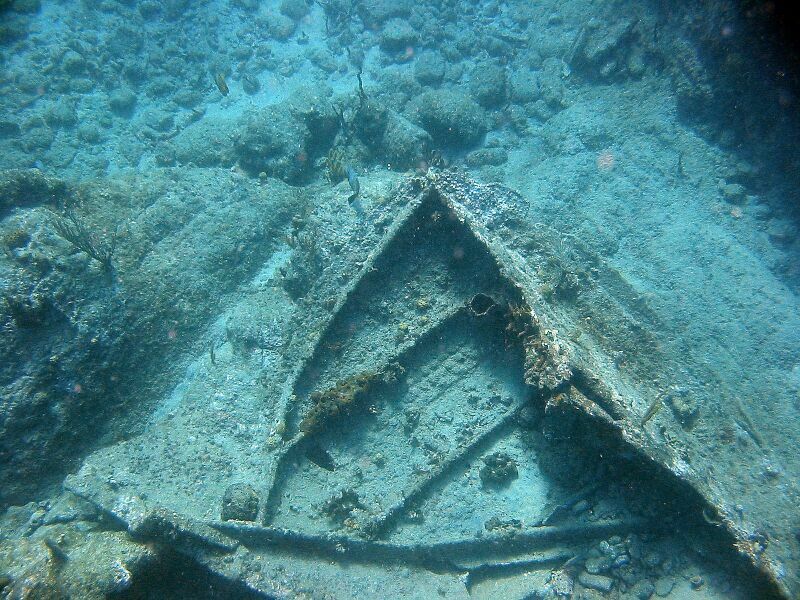 The real damage is the anchoring of the boats - why they don't just install mooring balls is a mystery. Oh well. 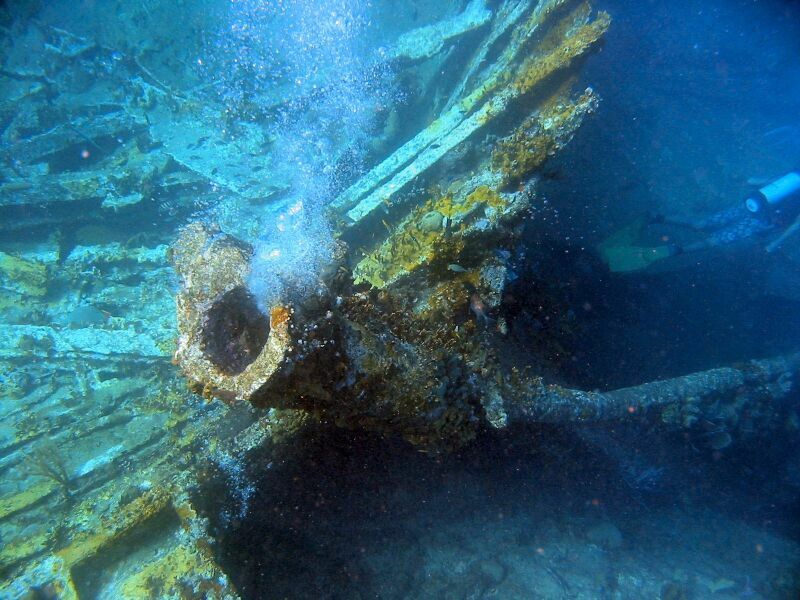 It's a shame as there are 300 documented wrecks around the reefs of the island. 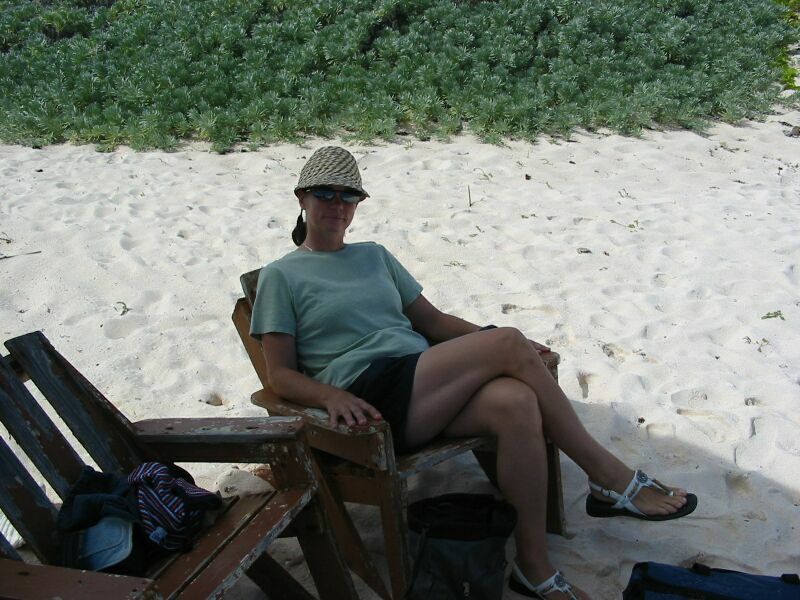 We had a relaxing few days in Anegada. 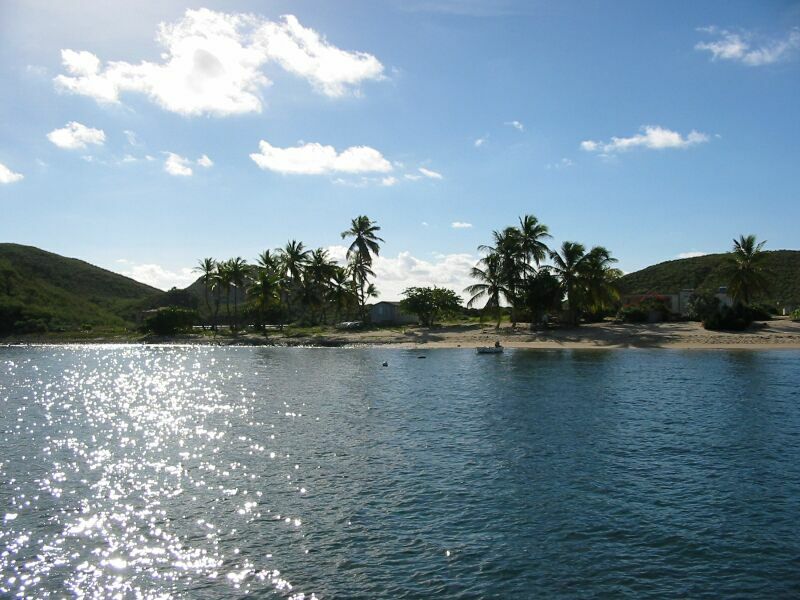 We left for Saint Martin/Sint Maarten (it's a French and Dutch island divided in half - roughly) on December 13. This concludes the Virgin Islands part of our trip - at least until we come back on our way across the atlantic next spring.